Fun to make, decorative wrist cuff that has a unique style! You can make it as is or bling it up with beads and charms. Be sure to look for the other accessories coming soon to complete your set. ldcp- Long Double crochet puff- (YO, pull up long loop in indicated stitch) 3 times, yo and pull through all loops, ch1 to close stitch. Magic Circle will not work for this pattern. Repeat R6 to R8 4 times for a total of 6 motifs. This will fit around a 10” wrist. If you have smaller wrists, omit the last one or two motifs. If your wrist is fairly larger, add an additional motif. Finish off leaving a 6” tail. Sew motif 6 and 1 with long tail. Cut yarn and weave in ends. 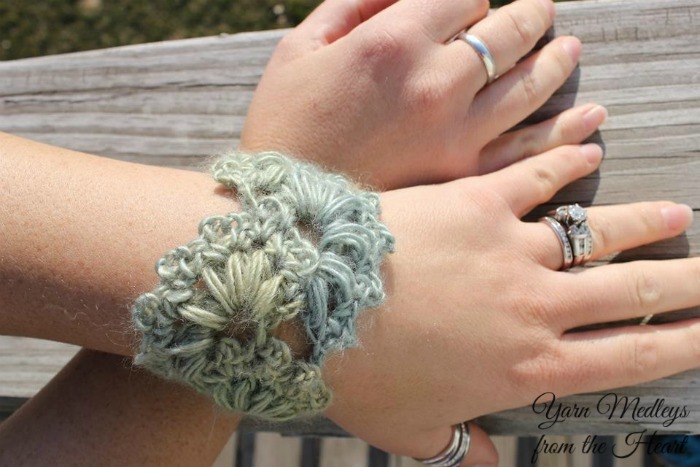 I hope you enjoyed the Spring Fan Wrist Cuff free crochet pattern. 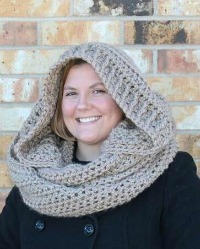 Check out all other contributor patterns by Yarn Medley’s from the Heart. Nondas Hensley is the owner of Yarn Medley’s from the Heart. She has been crocheting for 22 years. Her favorite things to design are new things with fun stitches. You can find her on Facebook, Ravelry and her blog.